Canada’s Future Appears Brighter under Trudeau’s Liberals - Canada Immigration and Visa Information. Canadian Immigration Services and Free Online Evaluation. 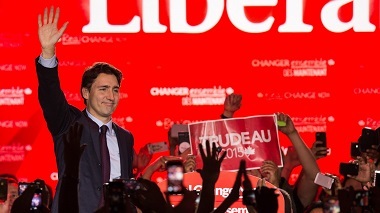 In 2015, Canadian voters elected Prime Minister Justin Trudeau, a leader with a vision for the country. Trudeau promoted inclusion and tolerance, focusing on the need to bring people together to solve problems. He promised to cut middle-class taxes while tackling climate change. Despite Canada’s economy being weighed down by a low Canadian dollar and oil prices, and the demise of the Keystone XL pipeline, the bigger picture still looks positive for America’s second-largest trading partner. Trudeau’s commitment to fighting climate change coincides with his recognition that the Canadian economy has been far too dependent on oil. Trudeau has already won the approval of the markets and local governments. In both Canada and the United States, cities are often on the leading edge of change. Ontario, the most populous province in the country has initiated a 10-year, $130-billion infrastructure program to improve its roads, transit and hospitals. The bonds sold to pay for those investments have been outperforming the national average, including in oil-rich Alberta. Investors have decided that governments with strong infrastructure projects are a better bet than those that are dependent on fossil fuels. With Canada becoming one of the world’s largest manufacturers of solar panels, Prime Minister Trudeau seems committed to increasing investment in low-carbon infrastructure and clean-energy technology. Investors and local leaders agree. Cities such as Montreal and Vancouver have set aggressive targets for reducing greenhouse-gas emissions. The public is being held accountable by making targets publicly available through a standardized reporting platform, the Compact of Mayors. The platform is available in over 400 cities globally. The investments in a low-carbon economy will help address another challenge facing the Canadian economy: individual and corporate cash reserves, which now stand at more than $500-billion. As more infra structure is built, more private-sector investment will follow, drawing more funds back into the market, leading to an increase in economic growth and tax revenue. Low interest rates means there has never been a better period for governments to borrow money payable long into the future to build new transit, schools and hospitals. Locally led actions that are aligned with market forces can drive a new era of growth for Canada. Justin Trudeau has shown that strong economic leadership begins with uniting people around a realistic vision that can be fulfilled if government works in concert with markets. Only time will tell how successful this approach will be for Canada’s new liberal government. Suis-je éligible au nouveau cheminement provisoire du Canada pour les aidants familiaux?